Yes you read correctly. I know, I know we are only halfway through Spring and I am talking about x-mas. And the funny thing is I am not even a big Christmas person. I bit more these days though because I have a little 3 year old nephew but generally we keep it low key in the family. But here is the thing. Last year when I visited my sisters Anja in December for a few trips to a proper Christmas Market (in Bremen) she had put up an Advent calendar for Hauke (her son, my nephew) which was some improvised thing where she put little presents in patterned tissue paper on a string. It was a poor attempt, no point in talking it sweet. And of course I wasted no time in telling her to which she responded something along the lines that it was me who was the creative in the family who could do something about it. So I offered to sew something much nicer for this year Christmas. 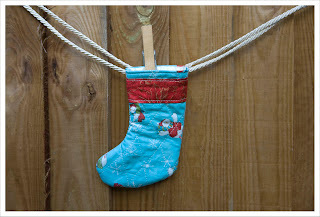 So, my plan is to sew a couple of those little stockings every months so I won't have to do something in a mad rush 3 days before Advent starts. Besides I am channeling here my inner and outer German organisation skills. 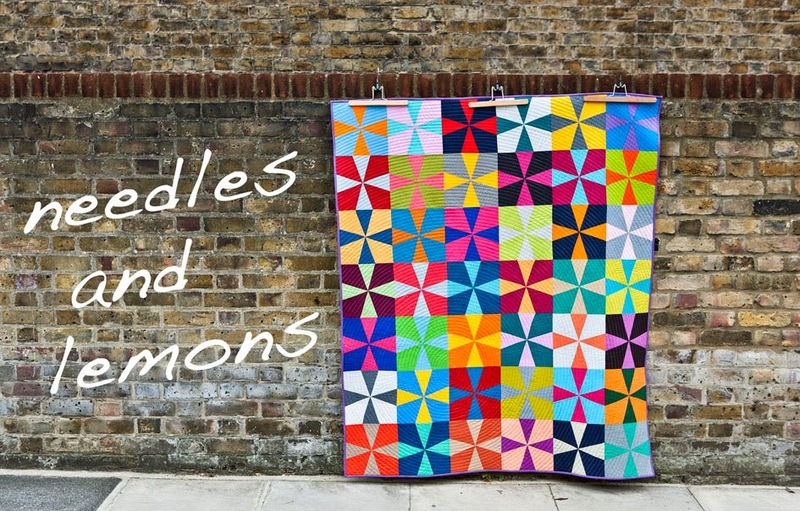 I bought some discounted x-mas fabric from last year at my local quilt shop but I have also ordered some new patterns from Michael Miller that will hopefully arrive in the next couple of weeks. 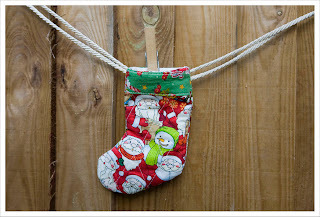 I have made a separate Advent calendar page on the blog where I add images of each new little stocking I make so you can follow my progress. Last night I made two and it really was great fun. I might even make enough for two calendars. I couldn't put both of them together on the rope as I only have one wooden cloth peg at the moment and that is even borrowed from my lovely neighbours. I want to secure the stockings with wooden cloth pegs because then my sister can put the calender high enough so Hauke can't raid it early but she can also take the stockings off easily to give every day one to him so he can find his little present in there. 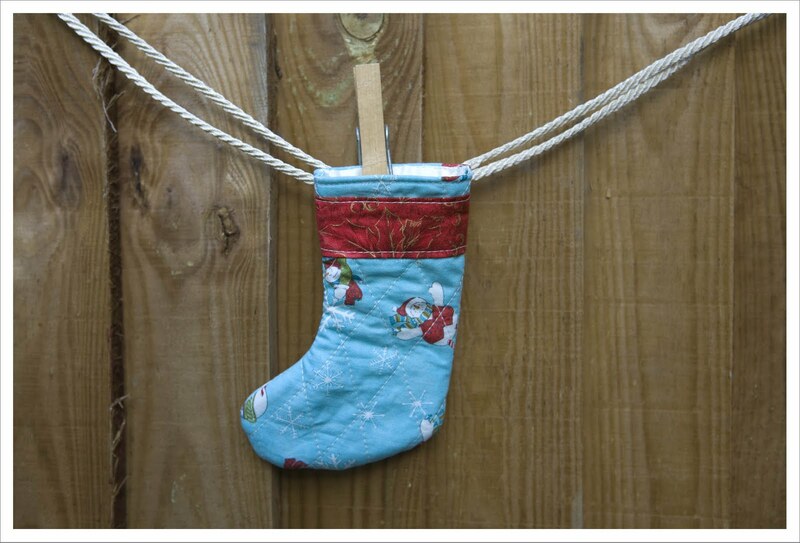 I won't put any numbers on the stocking as I think they are to small and it would clutter the design unnecessarily but might do something with numbers on the pegs. Let's see. Anyone fancy a tutorial on how to make this Advent calendar ? This is cute! I don't really do xmas so no advert calenders for me but I think this will look great! Too cute - I already have calendars for my kids but I haven't got one myself and this would be gorgeous - so can I make mine along with you? I love the idea of the numbers on the pegs instead of the stockings. It would look lovely like that and, as you said, not clutter the fabric designs. If you need more Christmas fabric let me know as I have had some in my stash for a very long time and would be happy to give you some. These are really cute :) Funnily enough I was speaking to my sister today about starting to make some christmas mug rugs soon. I just love your work - wish I had the patience to do the quilts ! the Advent Calendar are so cute. I posted the Tutorial on my Page. But your Link to Tutorial are wrong.